In the biblical text the Negev, as a regional-geographical term, refers to a limited strip of land extending 10 miles north and 10 miles south of Beersheba and running east to west from the mountain ridge overlooking the Rift Valley to near the dunes along the Mediterranean Sea. 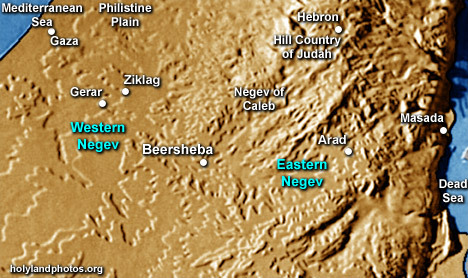 Topographically, the biblical Negev can be visualized as a double basin in the shape of an hourglass placed on its side, with Beersheba at the “waist” of the glass. To the north, east, and south of both basins is higher ground. The eastern basin, the administrative center of which was Arad, is drained by Nahal Beersheba, which flows west past Beersheba into the western basin, where it joins the Nahal Besor. The biblical Negev is a transition zone that receives only 8 to 12 inches of rain annually. If the norm is reached, wheat and barley can be grown, but in only one of every three or four years is an adequate crop harvested. For additional information on the Biblical Negev see Carl Rasmussen Zondervan Atlas of the Bible, pp. 54-55. Click Here to view.